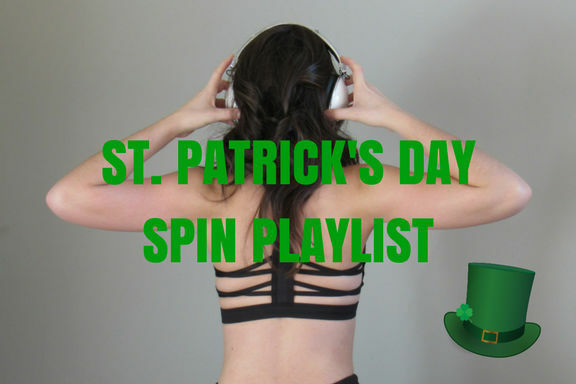 It’s fun to make a themed spinning music playlist and routine for St. Patrick’s Day, since there’s a lot more room for creativity and out-of-the-box thinking. When it comes to Christmas and Halloween, you’re often stuck playing the chart topping hits, because that’s what participants expect. For St. Patrick’s Day, you can throw in a bunch of quirky songs loosely related to the holiday and get away with it. I’m a big fan of tying together songs around a very broad theme, because then I can play the songs I want, and my participants get a kick out of the wackiness. This year, I’m adding a handful of Irish artists and songs about luck, gold and the color green to my St. Patrick’s Day spinning playlist and routine. Because, why not? If you’re putting together a spin playlist of your own, I encourage you to have fun with it! If you think a song will be awesome for spinning, but doesn’t fit perfectly into a theme, that’s okay. Here’s my St. Patrick’s Day spinning music playlist and routine. Since it is a St. Patrick’s Day spin playlist, the series is three songs long and the resistance on the bike mimics the shape of the rainbow. So, the resistance will get heavier for the first two songs and then dial down for the last song. Here’s the series — do it three times through. Song 1: Climb (Part 1). Start seated at a flat road resistance and moderate intensity. Add resistance periodically during the song to increase intensity, ending the song at hard intensity. If you do have monitors, try to stick to roughly the same RPM the whole song. Song 2: Climb (Part 2). Keep the resistance on the bike and continue the climb. This time, every 30 seconds we’ll go from seated to standing (and vice versa). Each time you stand, add more resistance to continue to increase intensity, starting in hard intensity and ending at breathless intensity. Please note: when you stand, the intensity of the ride will not be as challenging, so participants will get some reprieve during these times. Students will monitor what their intensity is like in the saddle (seated) going from hard to breathless. Song 3: Bring the resistance back down so that it’s just a touch above flat road and you’re working at a high-moderate intensity. When the chorus comes, students will go faster, finding a breathless intensity. If you have monitors, encourage folks to increase their revolutions per minute (RPMs) by 10-20. At the end of the chorus, go back to that initial resistance and intensity. Please note: if students need a longer recovery period, feel free to recover a bit longer at the beginning of the climb in Song 1.